Do jazz fans have “American Idol” to thank for one of the most acclaimed big bands currently performing? 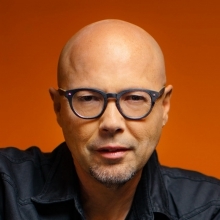 Unlikely as it may seem, John Beasley’s tenure as the associate music director and lead musical arranger on “Idol” led to his discovery of the music notation software Sibelius, which in turn led him to form his multi-Grammy-nominated Thelonious Monk tribute band. The 15-piece MONK’estra will perform a San Diego Symphony Bayside Summer Nights concert here next Thursday, Aug. 24, at Embarcadero Marina Park South. “After the first season of ‘Idol,’ I was still writing arrangements by hand and the volume of work was ridiculous,” recalled Beasley, whose recording credits range from Miles Davis and Steely Dan’s Water Becker to Carly Simon and Indian violin virtuoso L. Subramaniam. But Beasley didn’t have enough free time to compose new pieces of music. So he decided to use Sibelius to re-orchestrate “Epistrophy,” a 1941 Monk song that sounds just as fresh and vital now. Almost instantly, he said, a light bulb went off and the door to a brave new musical journey opened. “At first, I thought I’d whip something together and just learn to program,” recalled Beasley, who used to perform regularly at San Diego clubs with guitarist Peter Sprague and saxophonist Tripp Sprague. Monk was a singular pianist, composer and band leader. He is perhaps second only to Miles Davis — whose 1959 album, “Miles Davis and the Giants of Jazz” features Monk — as an American music icon whose work transcends jazz. Together with Charlie Parker, Dizzy Gillespie, Max Roach and an elite group of other innovators, he helped create bebop, the deviously intricate style that revolutionized jazz in the 1940s. Monk’s music is by turns playful, quirky, graceful and profoundly moving. His compositions are marked by zig-zagging melodies, unusual rhythmic twists, intricate harmonies and a unique sense of playfulness. “My dad had ‘Work,’ the 1954 Monk record with Sonny Rollins. That one really struck me, as a 10- or 11-year-old, as being humorous and playful. And it had unusual instrumentation, including a French horn. My dad being a bassoonist, I knew what a French horn was and knew it wasn’t common in jazz. Today, 35 years after his death, Monk’s many classic songs — which include “ ’Round Midnight,” “Blue Monk,” “Straight, No Chaser,” “Ruby, My Dear” and “Bemsha Swing” — remain some of the most played and beloved in (and out of) jazz. In addition to countless jazz artists, Monk’s songs have been covered by such varied admirers as Phish, Chaka Khan, Peter Frampton, Dr. John and former San Diegan Frank Zappa. His records have been sampled by Wu-Tang Clan, Gang Starr and other savvy hip-hop acts. 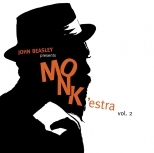 The captivating debut album “John Beasley Presents MONK’estra” Vol. 1” was released in 2016 by Mack Avenue Records. It earned two Grammy nominations for its musical excellence. The upcoming “Vol. 2” features Beasley’s all-star big band, along with such guest artists as violinist Regina Carter, singer Dianne Reeves, percussionist Pedrito Martinez and saxophonist Kamasi Washington. The 11-song album features Beasley’s ingenious arrangements of such Monk gems as “Evidence,” “I Mean You,” “Crepuscule with Nellie” and “Work,” the title track of the 1954 Monk album that captivated MONK’estra’s leader as a pre-teen. His brassy ensemble’s San Diego concert next week will feature selections from both MONK’estra albums. They wil be performed by a talent-packed lineup that includes drum dynamo Terreon Gully and Steely Dan sax veteran Bob Sheppard, Beasley’s former colleague in the late trumpet great Freddie Hubbard’s band. “You go to a concert to be moved,” said Beasley, who served as musical director for Steely Dan’s 1996 “Arts Crime” tour. The opening song on the new MONK’estra album, “Brake’s Sake,” features a socially inspired rap by trumpeter Dontae Winslow. Beasley stresses that MONK’estra’s concerts are about creating first-rate music and uplifting audiences, not engaging in politically charged polemics. But he believes artists have a responsibility to intelligently reflect the world around them and to help bring about positive change. And his band’s new album draws some of its inspiration from seeking to reflect the social realities Monk faced at a time when much of the United States, sadly, was still very segregated. “Musicians have been speaking out about resistance for a long time,” said Beasley, who cited Max Roach’s “We Insist! Freedom Now Suite,” Herbie Hancock’s “The Prisoner” and Charles Mingus’ “Fables of Faubus” as a few examples. The veteran keyboardist laughed when asked if, early on, anyone had told him he was crazy to form a 15-piece Monk big band, let alone assume the dizzying financial risk of taking it on the road. “Oh, nobody had to tell me. I knew it on my own!” he said. The 1964 live album “Miles & Monk at Newport” devoted one side apiece to concert performances by bands led by Monk and Miles Davis, whose band Beasley joined in 1988. He still cherishes the musical wisdom the mighty Davis imparted to him, on stage and off. “Miles didn’t like piano players to solo using both hands, because he felt — and I think he’s right in a lot of ways — that we tend to accompany ourselves with our left hand in a way that makes it cluttered for the rest of the band. Davis listened intently to the playing of his band members and would make comments to them, based on his observations, prior to concerts. One of those comments provided an epiphany for Beasley. “Then, I thought about how Ahmad will make a big statement, then back off and use a lot of space. I started doing that and Miles began to react in a positive way. So that was a huge lesson for me. And what did he learn from his “American Idol” tenure, when he worked with mostly inexperienced young vocalists? “ ‘Idol’ taught me a valuable lesson in addressing the question: ‘How can I serve the artist better,” Beasley replied. “I knew that before, but it was so much more obvious with amateur singers. A lot of those kids has never played with a live band before; they only knew karaoke. “I learned how to write and arrange so that, No. 1, it relieves their nervousness. I thought about: ‘How can I make them sound better? How can I write a string line that stays away from the melody, in case their singing strays?’ And, also, getting to know these kids and giving them confidence, so they could go out there and deal with all that negativity that they are thrown, and still be able to make music.